Where do you manage to get those from? You make 'em yourself. =3 Its easy to make on on MKDS, but its a lot harder to do it on F-Zero GX, since you need serious patience to make a custom decal. Its totally worth it though. ...forgot about this too because I haven't played Animal Crossing in a while XD Yeah I made a custom Boba print that can be used as a shirt or unbrella (shirt looks better though). 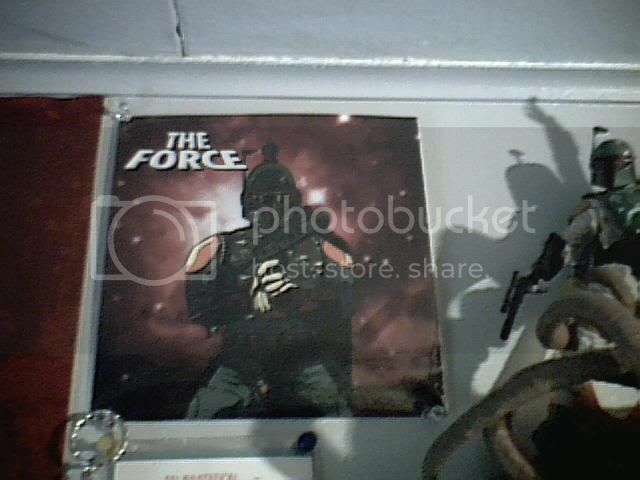 I have the Boba Fett Unleashed figure, the Boba Fett Transformer (My favorite piece in my "Collection"), a couple shirts with Boba and the Mandalorian Skull on them, a whole bunch of pictures I printed off the Internet and hung above my bed, and a bunch of other odds and ends. I'm still adding to my collection though. i don't know i cant make it out but when it gets here in 2-9 buisness days ill update but it looks like it says something funny to me. I'm just a part-time Spanish teacher, K-8...and he was getting an A+ anyway, but this just sealed the deal. By "vinyl" do you mean a record? And what exactly is on them? Probably my Boba Fett hoodie that I wear just about every day. ("Capture by Design. Kill by Necessity" Confusess my relatives an awful lot. XD ) Not just cuz it's Fett, but because I wanted a hoodie and it was just perfect for me. A lot warmer than it looks. A lot warmer than it looks. And strangely effective on rainy days. c3po-star wars man i was into that sh!# way before y'all ever had a clue. knowhutumsayin? i was kickin'it wit the millenium falcon while you sorry mugs was still pushin your hot wheels 'round the porch! Luke with r2d2 head on- i know!! wassup with all these perpetratin muthaf*!#as tryin to claim O.G. star wars geeks an' sh!#! don't ever try to front holmes. you claimin' O.G., but you know back in the day you had a MON-CHI-CHI! Chewie-and then there these crossover muthaf*!#as. the ones on the G.I. JOE tip until STAR WARS got on the one! this posin a$$ on my block tryin to mix his two sets together an' sh!# ! i clocked his sh!# with my Darth Vader carrying case!.. Boba Fett- SH!# everybody claimin' STRWARS these days. All these trendy muthas gonna drive me to claim Battlestar Galactica! so thats what they say( nothing on the back) i did my best to edit out the vulgarity without making it so you don't know the words. so i apologize ahead of time to the mods if it isn't good enough and if you have to edit it i understand so i guess if the mods do and you want to know what it says pm me. I have a stuffed Ewok from when they were released with Return of the Jedi. It is like 23 years old now and it still has it's cape. I bought that ornament set too, for the same reason! The little Fett helmet is hanging next to the Stormtrooper on my tree. I also have a little figure of Boba with blaster standing on top of my computer, the Boba Pez dispenser on my desk, the Burger King water squirter on my bookshelf, and the watch hanging on a nail on the wall. Also, a stack of books featuring Boba in the bookshelf and a Boba Widget on my desktop that utters Boba quotes when you double-click on it. I really want to get that sweatshirt! I have the ornament set now too. It's cool! I have a few of the old 1983 Ewok teddybears too, but I don't see how that relates to Fett? Well not to Fett but SW in general. Anyway their was supposed to be a museum in Coruscantthat showed the Battle of Endor with a stuffed Ewok their perhaps they hired Fett to get one. Hence the lame tie in. Hey it was in the bloopers on the Super-Ultra Editions of the OT dvds. Wicket runs around a corner and Boba's right there behind him. 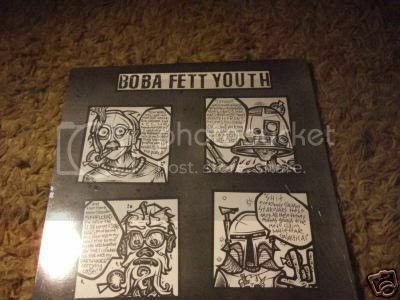 Did you see the outtakes in The Bounty Hunter Game? Dude those were hilarious. Especially "Nobody comes to see a Hutt without something to offer..."
I like the one were Vosa slaps the snot out of Jango. That one is good as well. lol im just thinking about level where the Bandogorra had a spawn point and i was somewhere they couldn't get me and i just kept torching them as they came. From my understanding, that was from a documentary/ mockumentary about the boy who played Wicket, and/or Wicket.